NEW ALBUM WRANGLED OUT NOW Angaleena Presley will return to the UK in October for the CMA Songwriters Series tour, taking in London as part of the inaugural Country Music Week, Gateshead, Glasgow and Liverpool. Angaleena will perform alongside Randy Houser, Eric Paslay and Michael Tyler. 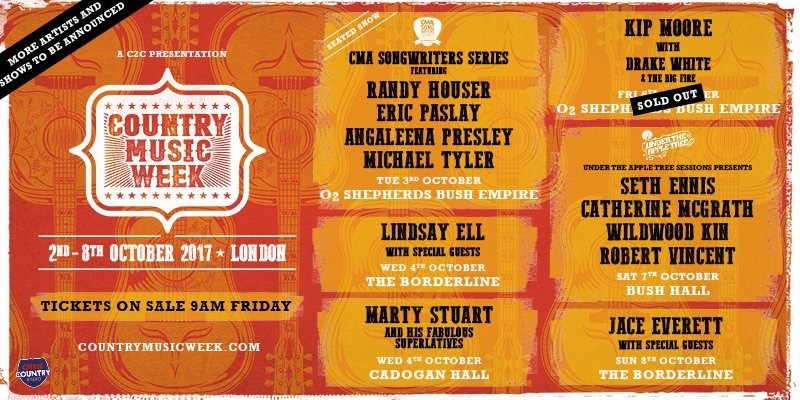 The CMA Songwriters Series has been presenting the very best of Country Music’s songwriters and artists, whose hits are known worldwide, since 2005. The shows are intimate presentations where songwriters exhibit their craft and share many of the stories behind the songs they have penned. The follow-up to her critically acclaimed 2015 debut, American Middle Class, Wrangled (Mining Light/Thirty Tigers), features songs co-written with Chris Stapleton, Miranda Lambert, Ashley Monroe, Wanda Jackson and Guy Clark. Once again, Angaleena took a lead chair at the studio’s board, co-producing with Oran Thornton (Eric Church, David Nail) and recording close to home at famed “Ronnie’s Place” in Nashville. “Wrangled is an explicitly forthright journey through my experience in the business of Country Music. I tried to tackle uncomfortable realities like the discrimination against female artists at the height of Bro-Country, the high school mentality of Music Row and the pain that’s just beneath the surface of the road to stardom,” says Angaleena. One of the album’s many highlights is “Cheer Up Little Darling” — which Angaleena co-wrote with her dear friend Guy Clark. This is the last song completed by Guy before his death and features Shawn Camp playing Guy’s No. 10 guitar, which was used to write the song with Guy, and Guy’s mandola, which he had been learning to play during the last year of his life. Another spotlight track is “Dreams Don’t Come True,” written with Pistol Annie sisters, Miranda Lambert and Ashley Monroe. “Only Blood” was written with fellow East Kentuckian, Chris Stapleton and features Morgane Stapleton’s unmistakable vocals, while “Good Girl Down” yielded unforgettable moments with the legendary Wanda Jackson. This album echoes The New York Times’ description of Angaleena: “Ms. Presley has her identity locked tight.” And boldly reflects her signature “gutsy songwriting and potent narratives” (Associated Press) that make her artistry “remarkable” (NPR). The Wrangled track listing is below, with songwriters in parenthesis.